You have access to snacks, drinks and toiletries during your stay, as well as some time to connect with other guests. Then the following morning, you receive a delicious home-cooked breakfast prepared by Brett and Mindy. So relaxing! The Tibbett’s House was built in 1914, and each room is themed after popular literature. You have the West Egg that is based on “The Great Gatsby,” The Loop from “Miss Peregrine’s Home for Peculiar Children,” and 221 B Baker Street based on Sherlock Holmes. Other rooms in the house are designed for the guests to feel a certain eccentricity, but still be quite comfortable. The uniqueness of the Bed, Breakfast & Books is illustrated by the color choices, art on the walls, themed rooms and architecture. This allows guests to escape their daily reality for a cozy and imaginative stay. The owners thank their customers by giving them one book, free of charge from their bookstore. The Castos take pride in their exclusive business experience at Bed, Breakfast & Books for various reasons. They offer a unique experience that is welcoming to all sorts of people and avid readers. As for the Bookstore, they promote reading during every visit, and encourage guests to take a free book upon departure. They also buy, sell and trade books in the community. Mindy has been in the U.S. Air Force for nearly 20 years and has dreamed of owning a Bed & Breakfast for quite some time. Brett is a self-published author, who runs the bookstore operations and games. They both love interacting and building relationships with their guests. These two businesses work hand in hand, as visitors come together to share and create memories, almost like a book. Guests are captivated by how passionate and driven the Castos are with their businesses. The Tibbett’s House: Bed, Breakfast and Books is here to stay and welcomes all to take advantage of their special $20 December discount. For more information, contact The Tibbett’s House: Bed & Breakfast & Books at 618-772-8161. It is located at 809 9th St. in Highland. Visit tibbettshouse.com or Facebook and follow on Twitter. The Illinois SBDC for the Metro East assists start-up ventures like The Tibbett’s House: Bed & Breakfast as well as existing businesses headquartered in the nine-county region of Calhoun, Jersey, Madison, Bond, Clinton, St. Clair, Washington, Monroe and Randolph. It is funded in part through a cooperative agreement with the U.S. Small Business Administration, Illinois Department of Commerce and Economic Opportunity, and SIUE as a service to Illinois small businesses. 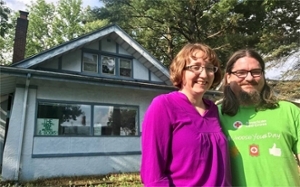 Photo: Tibbett’s House owners Mindy (left) and Brett Costo.